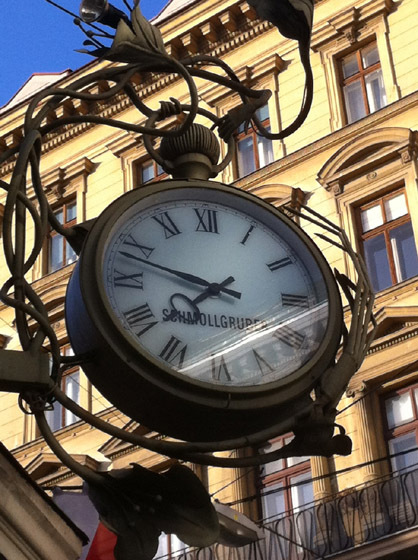 Vienna’s palaces, museums and galleries are all well known. But how about the city’s smallest house? Do you know where it is and what it looks like? 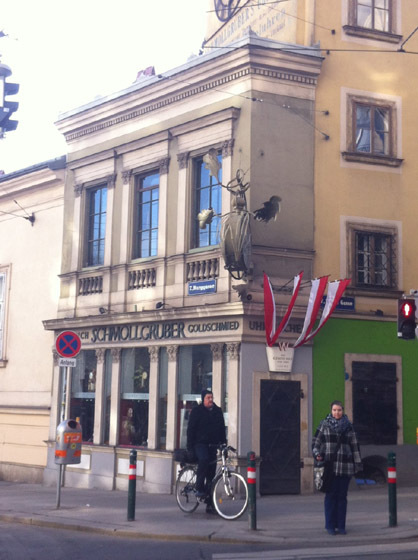 In Neubau, Vienna’s 7th district, on the corner of Burggasse and Breite Gasse, there is a house which has been officially declared to be the smallest in Vienna, as well as protected as cultural monument. This part of town is very jazzy and picturesque; here you can find the famous Museumsquartier and Spittelberg, but also lesser known and nonetheless beautiful Siebensternviertel, as well as numerous narrow streets with small boutiques, art galleries, antique stores and small family business. The large multinational stores have not – at least for the most part, excluding the popular Mariahilferstraße, which borders on the 6th disctict, as well as several other broader streets – entered this neighbourhood; quite the contrary, here you’ll have a chance to style yourself, outfit your apartment and get music and books to your personal, individual taste. The house was built in 1872 and was designed by the architect Josef Durst. Its layout spreads on not more than fourteen (14!) square meters. 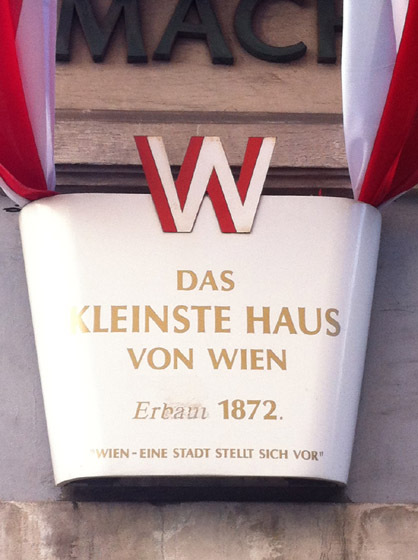 From the time it was built until today, the house’s name changed three names; first, it was called “By the white grapes” (Zur grünen Weintraube), then “By the golden lamb” (Zum goldenen Lamm), and finally “By the golden deer” (Zum goldenen Hirschen).Since it was built, the goldsmith and watchmaker Friedrich Schmollgruber’s shop has been in the house. 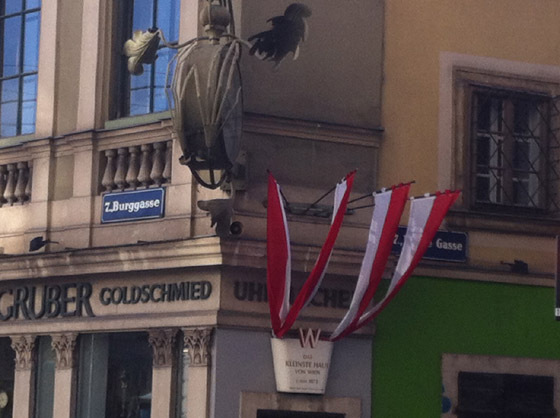 So, if you happen to be in this part of the town (perhaps visiting the Volkstheater, going to the Museumsquartier or just having a mug of Christmas mulled wine at the Spittelberg), I would say it would be impossible to miss the Neo-Gothic facade and the windows with the columns with Corinthian capitals between them. So, do look up this house. It is small indeed, but very beautiful. 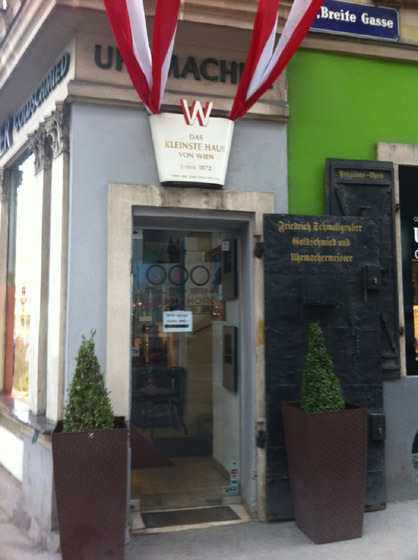 This entry was posted in Vienna and tagged 7th district, Breite Gasse, Burggasse, Neubau, the smallest house, Vienna, Wien. Bookmark the permalink.